Follow RunningAHEAD.com on Twitter to receive news and announcements. RunningAHEAD's running log is completely free. It is simple and intuitive to use yet allows you to record all aspects of your training. Track your shoe mileage and map your running routes. You can create custom activities and workout types. You can enter your data manually, upload your workouts directly from your Garmin Forerunner GPS or data files. Analyze your running data and display your statistics and maps on your blog. Whether you just started running or training for your next marathon, a training plan keeps you focused and motivated. 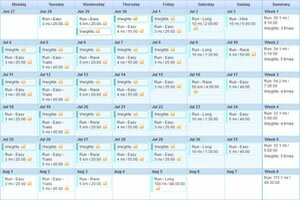 The RunningAHEAD training plan designer is easy to use like Excel and it is fully integrated with your running log. 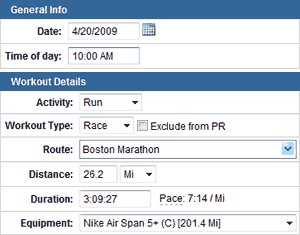 Create a full marathon plan in a few minutes and view scheduled and completed workouts on your calendar. Reuse an existing training plan for your next training cycle by making a copy of it. Similarly, you can copy another user's plan and modify it to your needs. Create your running route maps in a few clicks using the auto follow road mode. Running in the trails? Switch to the manual mode to trace the route using satellite map view. The elevation profile is generated automatically as you map your running route. Place the cursor on the elevation profile to see the altitude of a specific location. 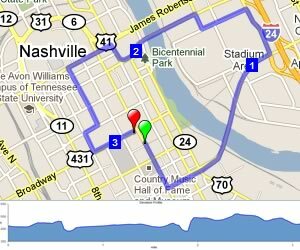 Share your running routes with your friends or display them on your website! Browse the database to find running routes in your area. 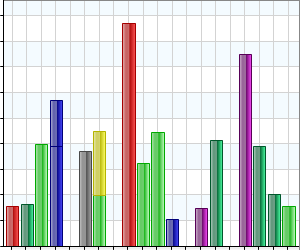 Traditional training logs provides only a few graphing and reporting options only. RunningAHEAD's dynamic reporting technology lets you do your own data analysis. Create custom graphs to visualize your progress. Search for data using your own criteria. You can save the generated graphs and reports for future use. Embed the graphs of the data on your website to show off your progress to your friends. RunningAHEAD offers a collection of free tools, including the best online running log, to help you train effectively. There is more to a running log than just entering statistics. It should be an integral part of your training, whether you are new to running or qualified for the Boston Marathon. At a minimum, it should give you a broad overview of your training at a quick glance. Ideally, your running log can help you identify areas of weakness, or act as an affirmation of your achievements. You lead an active life, and need a running log that keeps up with you. You can record all your workouts with RunningAHEAD, so you can go back to doing what you love quicker. Download your Garmin Forerunner GPS data directly to RunningAHEAD. All your data will be converted to workouts and saved to your running log. Analyze your imported data through charts and maps. RunForth is a free iPhone app intended to complement RunningAHEAD. It integrates with RunningAHEAD to allow you to upload GPS workouts and log workouts manually, create equipment, and manage courses. Handy Runner is a free Android application for tracking your running workouts via GPS. It integrates with RunningAHEAD's running log, allowing you to upload your GPS workouts and also to view weekly statistics and recent workouts that were logged on RunningAHEAD. You can download the application from Google Play.